I've recently purchased and received a lot of new skincare so I decided I wanted to give my skincare routine an overhaul for 2014. I thought I'd discuss which products I'm going to incorporate into this routine and share any first impressions I have with you all. I'd love to hear your thoughts on these products too if you have used them. REN Rosa Centifolia Hot Cloth Cleanser (REN £16.00) - This is a very recent purchase that I haven't tried yet but I couldn't resist it after seeing it in Marks and Spencers last week. I've enjoyed using hot cloth cleansers by Elemis and Liz Earle in the past so after loving REN lately, I thought it would good to try this one. I was quite surprised this cleanser is only £16 too, I thought it would be over £20 so that's a good start. REN Rosa Centifolia No.1 Purity Cleansing Balm (REN £23.00) - I received this for Christmas and have been using it throughout January. I think this is such a good cleanser. It's really soothing on the skin, has a gentle rose scent and leaves my skin feeling soft and moisturised. I hate cleansers that strip my dehydrated and slightly sensitive skin so I'm glad this one doesn't do that. My only criticism of this cleanser is that it stings my eyes so I can't use it for eye makeup removal. That doesn't put me off this though. L'Oreal Paris Skin Perfection 3 in 1 Purifying Micellar Solution (Boots £3.33 on offer/£4.99) - Not a new product considering this is my fourth bottle of the stuff and it's nearly finished but this is going to be in my routine for a long time. It's such an inexpensive, high performing makeup remover that is gentle enough to use on the eyes as well as the rest of the face. Elemis Rehydrating Ginseng Toner (Time to Spa £21.00) - I've mentioned my love of Elemis toners before, my favourite being the Soothing Apricot Toner, and I've repurchased them so many times now. They are amazing toners that are alcohol-free, delicately fragranced and incredibly soothing on the skin. They have a spray nozzle for direct use on the face or for spraying into a cotton wool pad. I don't like being without one of these toners. Clarins Gentle Exfoliator Brightening Toner (Clarins £25.00) - This toner is a blogger favourite that removes the build up of dead skin cells as well as encouraging cell renewal. This can be applied once or twice a week. I do find that it leaves my skin feel quite tight after use but this is quickly rectified on application of my moisturising products. I don't think I've used this enough times to see a big change in my skin yet but I do think the area either side of my nose is improving as this is where I usually see dead skin cell build up, yuck! The one thing that worries me with this product is the fact that it warns you to use sun protection with it as it can increase your skin's sensitivity to UV rays. Obviously it's recommended that you use sun protection every day anyway but I don't like the thought of making my pale skin even more sensitive to the sun! La Roche-Posay Effaclar Duo + (Escentual £15.50) - Another blogger favourite is Effaclar Duo, which I thought I had ordered from Escentual but then this new '+' version turned up. My research tells me that this has all the same benefits of the regular version but it also is good for reducing and preventing the scars that blemishes can leave behind. I suffer with this on my chin so I'm happy they have improved the formula! This product is suitable for all over the face but I've just been using it on the chin area where I get spots. I haven't noticed any reduction in red marks yet but I do find this very soothing on the skin and I think it reduces any spots I have as well as stopping spots in their tracks when they first appear. I've found this works well under makeup and doesn't dry the skin out at all like other spot treatments can do. La Roche-Posay Hydraphase UV Intense Riche (Escentual £16.50) - I bought this from Escentual as well after deciding I wanted to dabble further with La Roche-Posay skincare. This seemed to be the perfect moisturiser for dehydrated skin. It comes in 4 versions, a light and an intense without SPF and a light and intense with SPF20. I opted for the intense due to the freezing cold weather drying out my skin and the SPF20 due to using the Clarins Exfoliating Toner as mentioned above. This is a really rich lotion that adds a lot of moisture to the skin. I like this element but I do find the product makes me a little shiny in the t-zone area. A bit of powder can easily fix this though. I'm really glad I tried this and I might try the light version in the Summer months. This product comes in a bottle with a pump so it's nice and hygenic, not to mention easy to dispense. Kiehl's Skin Rescuer (Kiehl's £29.50) - I picked this up for free a couple of months back as my local Fenwick were offering it for free with a skin consultation. I thought this was really generous. This hydrating moisturiser was developed for dull looking skin and uneven skin tone. I've used this a few times and it's good at putting moisture back into my skin and taking away some redness. I'll keep this on hand for red skin days! Elemental Herbology Cell Food (Space.NK £45.00) - This is a milky serum that helps add radiance to my skin. A little goes a long way with this which is good considering its price! This is definitely helping to keep my skin hydrated during the Winter. Clarins Blue Orchid Face Treatment Oil (Clarins £30.00) - This is another product where a little goes a long way. This is a rich oil that I put on my skin before bed. It does leave my skin feeling a bit greasy but it sinks into the skin throughout the night delivering a big dose of hydration which you can feel when you wake up in the morning. There are other versions of this oil for oily and dry skins too if this is something you like the look of. Bobbi Brown Hydrating Eye Cream (John Lewis £31.00) - I bought this on a bit of a whim after it was recommended by the lady on the Bobbi Brown counter who sold me the Corrector and Creamy Concealer Kit. I'm really liking this cream though. It's not really heavy but it provides just the right amount of moisture for my dry under eye area. It makes it a lot easier to apply concealer to this area. 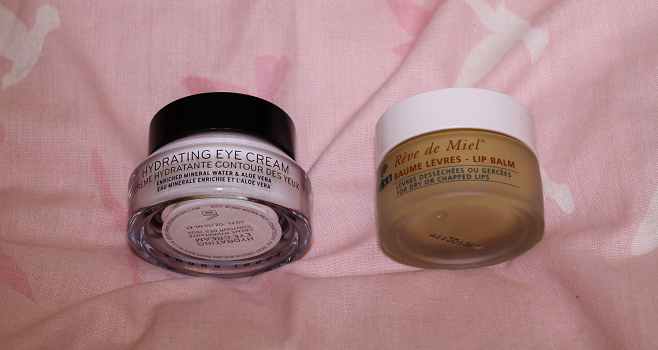 Nuxe Reve de Miel Lip Balm (Nuxe £9.50) - I love this thick lip balm so much this is my second jar. It really smoothes the lips and gets rid of any dryness. It smells great too with its citrus scent. This is definitely worth investing in. 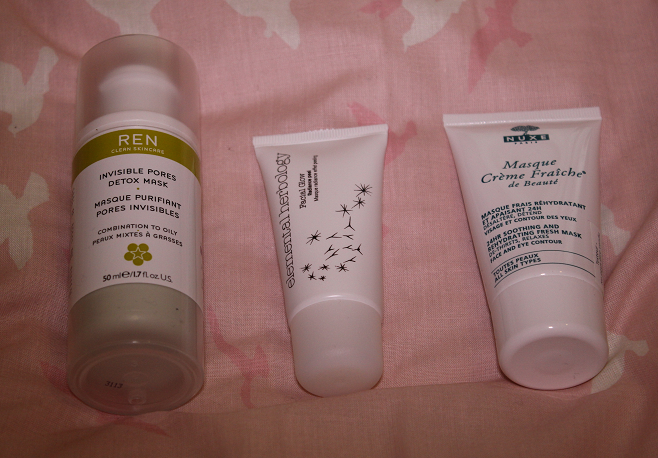 REN Invisible Pores Detox Mask (REN £18.00) - I haven't got round to using the masks from this photo yet as I haven't made time for it but I have used a sample of the REN one before. I have some large pores around my forehead and nose which the mask massively reduced in size. They really did look invisible! It also left the rest of my skin looking really clean and more even too. I need to make time to use this full size one now! Elemental Herbology Facial Glow Radiance Peel (Space.NK £40.00) - I got this deluxe travel size version in a set with the Cell Food serum mentioned earlier. I'm looking forward to trying this when I want an extra boost of radiance. Nuxe Creme Fraiche de Beaute Mask* (Farmaline £16.81) - This is going to be my face mask pick for when I want to inject some moisture in the skin, in addition to all of the other rehydrating products I've got in this post. I'm thinking it might be good to use after one of the masks above to make sure my skin isn't left too dry or sensitive. I could even go for a famous 'Triple Threat Facial' a la Caroline Hirons with all three of these masks! 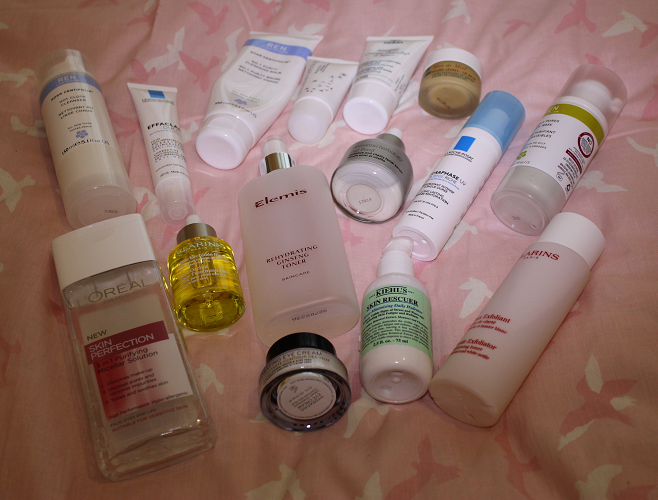 So that's a lot of new skincare products to use this year which I'm enjoying so far. Let me know what skincare products you've been into lately and I'd love to hear your opinions on any of the above.